Even if you say you don't. Even if you block it out of your mind and deny that it ever enters the realms of your thoughts. If you're like me, you'd never speak of it......even if you did have one. For a runner like me, a time goal is just too scary to even talk about in public ~ let alone actually document in writing where others (including myself) might be able to refer back to it at later date. After all, I'm a *just finish* runner ~ so I really don't need a time goal. It's now two months out from the RNR Half, and I'm so happy to be right on track in my training. I'm getting two short runs in during the week (usually if all the planets align) and a long run on the weekend. And the best part is that my long runs are improving. 1. 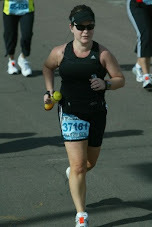 No leg cramps at Mile 10! Not too lofty of goals, really....and if I met all on them on January 19th, I'd be one happy camper. So why the thought of a time goal is entering my brain, I really have no idea. I'm trying to repress it, but it's trying hard to come out. The thought of adding a PR as #4 on the goal list is just getting way too tempting! My long runs lately have felt decent ~ although I was extremely tired during Saturday's run (but I think we all were, so it must have been something in the air!) ~ and for the first time, ever, I am able to average under 13mpm during a long run. My PR for the half marathon distance was somehow set at the Valley of the Sun last year (don't make me drudge up the gory details and discuss how good mine and Lisa's time SHOULD have been based on our performance up until the time that I cramped up....) and averaged just over 13mpm average pace. I do have to admit that this alone is amazing due to the amount of walking we did over the last 3 miles (due to yours truly, of course...UGH)....but I digress. Our final finish time was 2:52 and some change.....when it really should have been somewhere between 2:30 and 2:40. I still get frustrated when I think back to that day. Then I snap back into reality and focus on my REAL GOALS. Time may or may not be on my side this year, but I am trying not to obsess about it. The good news is that I am still two months out from RNR and have already hit some serious long run distances. There are still 12, 13 and 14 mile long runs in my future.....but I know that I am on the right track to being READY. Ready to IMPROVE and ready to finish with a SMILE :) Isn't that all that really matters in this silly sport??? ORN: Long Run with TRC peeps Pat, Candace & Christina ~ 11 miles ~ 2:20:33 ~ 12:46 average pace. I am sure of it. No doubt in my mind. What....you didn't see the pigs today?? Maybe you will find this even stranger........today I ran 8 miles. No really. I RAN 8 miles. I didn't run and walk 8 miles. I RAN. CONTINUOUSLY. Like real non-stop running. With no walk breaks!!! It was mileage "cutback" week on the ol' training plan, so a few members of the TRC headed out to brave the 42 degree temps (brrrrr.....chilly for AZ!) this morning at 6:30am to trek along the canals as usual. Don't get me wrong ~ our pace was extremely slow ~ but we ran the entire way. The only exception was one quick stop for me to take off my shirt (don't get too excited peeps....I had a tank underneath) and then one quick walk break at about mile 5 for nutrition consumption (didn't last longer than about a minute). Other than that, Candace, Christina and I ran, and chatted, and ran and chatted for an entire 8 miles. And I felt FANTASTIC! This is a first for the Pokey Record Books and something I hadn't even intended when we headed out today. But once we realized that none of us felt like walking, we kept the slow steady pace and knocked down the miles. Garmin is in my car, but I think we finished in about 1 hour 40 minutes or about a 12.5 mpm pace. Good, GOOD things are happening around here in Running Land lately....and it only makes me more and more motivated each day! I'm not fast by any means, but I'm improving. Long run paces are getting marginally better, and my endurance is definitely improving. Have I mentioned how much I love running??? Better watch out for them pigs!!! TREADMILL and SPEEDWORK….not necessarily in that order and particularly if they would ever happen to be combined in the same sentence. That would be horrible! So it is interesting that the past couple weeks have brought me to the point of trying to combine these two miserable words in my running repertoire. Seriously. The tread(DREAD)mill??? Well, I’ve found that it has its place in my life when extra time is lacking and kids are sleeping (I hear you can get in trouble for leaving young kids along unattended, eh??) It used to be an old friend of mine back in my early running days when I didn’t have the guts to venture outside much where the *real* runners were. God forbid, I might actually be seen running. Now that I actually like it when people I know comment on having seen me running down the street, the treadmill has become a dusty piece of equipment in my garage. Using it bores me to tears, unless there is a good episode of The Office or Oprah on TV while I’m pounding away. But time and schedule crunches in the past few weeks – combined with my commitment to myself that I WILL get short runs done during the week – have made the dreadmill a trusty companion. We’re not in love, by any means – but we tolerate each other for the sake of the kids. You know – the ones sleeping upstairs while we rendezvous in the garage. I am learning a whole new respect for my dear dreadmill – I hope it’s not just a fling. And because time has definitely been of the essence – enter the other painful word from my running mental block: Speedwork. And the bonus? I actually feel like I have done something different, pushed myself a bit harder, left my comfort zone, and gotten in a decent run where otherwise I would have just been laying in bed dreaming about running. I love me some speedwork on the dreadmill!!! I can’t wait to get back on the dreadmill tonight!! I think I have time to surface today for a quickie update....thanks for all the emails checking in on me.....everything is finally settling down a bit. Things have improved greatly with my son and his hip issue, but it took two long weeks of doctor appointments, xrays, MRI's, crutches, and a lot of tears and frustration (mostly from me). I don't like being a bloggy whiner, so it was easier for me just to not talk about it all here. I also didn't feel the need to air every emotional meltdown I had in the past couple weeks, and believe me...there were plenty. I think we are status quo for now....thanks for all the good thoughts and prayers! 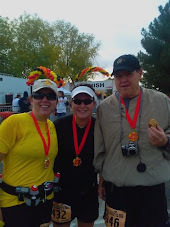 I've had a couple great long runs the past couple weekends ~ especially yesterday with Pat and Candace. So good, in fact that I had to steal Pat's splits from his blog since I am too lazy to upload mine :) We got just over 10 miles done, and I have to say that the first 5 miles of the run were the fastest I have EVER run that distance! For me to average under 12 minute miles for 5 miles is a serious success. You can see that we slowed dramatically for the second half of the run, and apparently walked a bit. Pat's neat software (you can check out the details on his blog) shows our average "running" pace (when we were running, not walking) at 11:22.....again, which is a big deal for me. The final distance was 10.4 miles at an overall average of 12:26. Bring it on PF Changs!!!! The plan for this week includes returning to work on Tuesday (wasn't in my office except for all of 2 hours last week! ), 2 short runs and then a *cut-back* long run of 8 miles on Saturday morning. Oh yeah, and trying to keep everyone in my family healthy and on their feet ~ literally!